choreographed. In fact, this is not usually the case in such demonstrations. The harmonious flow between attacker and defender is largely due to the attacker being adept at the art of ukemi (i.e., taking the fall). 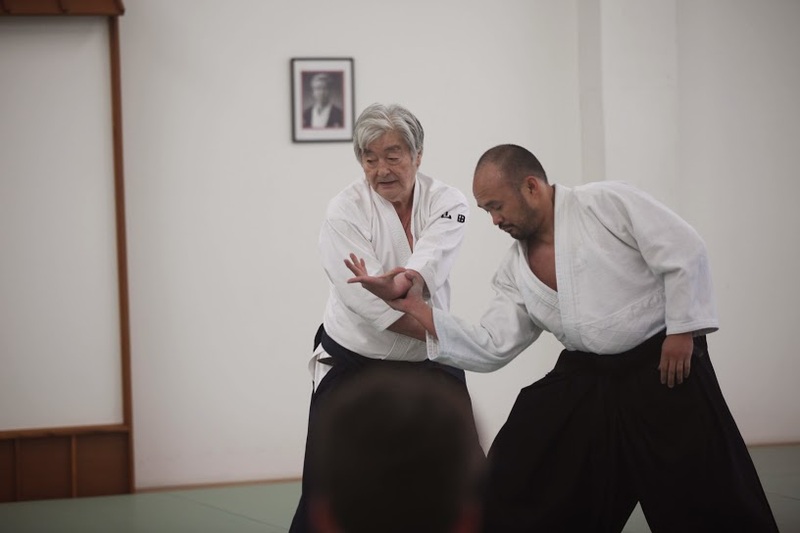 During my introductory remarks at Southland Aikido’s recent Open House, I described the art of ukemi as “the other half of Aikido.” Indeed, becoming proficient in ukemi is a challenging and long-term training process for most students. First, he or she must learn the basic ukemi techniques – forward rolls, back rolls, side rolls, break falls, taking various wrist locks, etc. While these techniques are the most visible part of ukemi, they are not the essence of it. The essential, but less obvious, aspect of ukemi occurs after the attack is launched and before the fall. During this phase of ukemi, the uke (i.e., faller) must move in a way that puts him or her in the best position to take the fall or lock and pin. This requires following the forces generated by the nage (i.e., thrower) while maintaining as much self-control as possible. As nage’s role is to break uke’s posture and balance and control uke’s movement, the effort to maintain some self-control by uke must be done without becoming stiff or resistant; otherwise, he or she will not end up in the proper position to take nage’s technique and is at higher risk of injury. Thus, becoming proficient in ukemi is not only a desirable skill, but it is also important for injury prevention. corresponding defensive technique. In this “choreographed” practice both partners are learning their respective roles, usually with many repetitions and alternating roles within a single practice session. Both partners benefit in their skill development from this process. However, in jiu waza (i.e., free technique) training or in most public demonstrations, uke does not know what defensive technique nage will employ against his or her attack. In these scenarios the ukemi skills developed during hundreds-of-hours of partner practice facilitate uke’s movement in a way that optimizes the ultimate ukemi technique. As Aikido is about harmonizing with the other’s energy, the technique of both partners is enhanced by skilled ukemi.